These three shrubs, brasil, knifeleaf Condalia, and lotebush are common but seldom chronicled shrubs of the South Texas Plains. 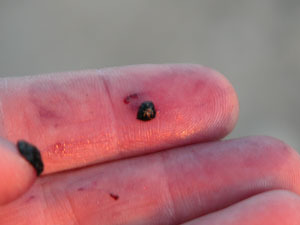 They produce an abundant crop of small purple-black fruits eaten by both wildlife and humans. Although ethnographic references are available only for lotebush, I have eaten hundreds of the small drupe-like fruits from all three species. The fruits have a thick, juicy, deep purple pulp that is quite tasty. At first glance these shrubs are somewhat similar. However, lotebush is a shrub with spiny, gray-green branches and alternately arranged, deciduous leaves, and the Condalias are evergreen, that is they keep their leaves year-round. Knifeleaf Condalia is a spiny, almost impenetrable shrub with evergreen leaves arranged in clumps called fascicles and it grows in a low, wide, irregular dome shape, seldom over 3 feet tall. Brasil is much taller, with open branches, and can grow to 15 feet. 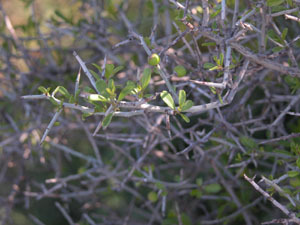 Lotebush can grow to about 6 feet in height, and in the winter the leafless, gray-green and spiny branches are easily spotted from a car window (Everitt and Drawe 1993; Johnston 1962; Taylor et al. 1999). Archeological occurrences. There are no reported occurrences of either the Condalias or lotebush from archeological sites located in the South Texas Plains, primarily because so few archeological excavations have been conducted there. However, Condalia seeds were noted in 3,000 year-old deposits in the well-preserved rockshelter deposits of Hinds Cave in the Lower Pecos, located just to the west of the area (Dering 1979). Food use. Please bear with me through this discussion, because Condalias have confounded observers for decades, as illustrated in the ethnographies of the Southwest. One observation, by Castetter and Underhill (1935) lists Condalia spathulata as being eaten raw by the Papago of southern Arizona. However, Hodgson (2001) suggests that these observers really meant Condalia warnockii var kearnyana, a subspecies of the Trans-Pecos shrub named for Barton Warnock, an iconic botanist of the Big Bend and Thomas H. Kearney, author of the flora of Arizona. The fruits of Condalia warnockii var kearnyana are very similar to Condalia spathulata and Condalia hookeri, and both probably were consumed wherever native groups encountered the ripe fruits. 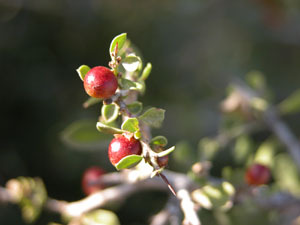 The other ethnographic references mention lotebush, Ziziphus obtusifolia, but by its obsolete name Condalia lycioides. 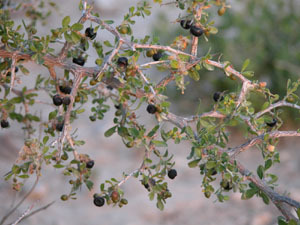 Lotebush fruits were eaten by the Maricopa, Mohave, and Pima (Castetter and Bell 1951; Curtin 1984; Russell 1908). Lotebush is a relatively common shrub of the South Texas Plains. The sweet fruit was gathered and eaten raw, or boiled into a syrup. To avoid its spiny defenses, the Pima would beat the bush with a stick and gather the fruit off of the ground (Russell 1908). Medicine, hygiene: Pima used suds from lotebush (cited as Condalia lycioides) roots for shampoo. The Pima also pounded lotebush roots in mortars and after boiling the mash, using the extracted liquid as a treatment for sore eyes. The Apache used the spines to pierce the skin in achy areas, washing off the blood with cold water (Curtin 1984; Russell 1908). I have inadvertently tried this remedy, because every time I have tried to collect any Condalia or lotebush plant or its fruits, I have washed lots of blood off my shredded forearms and hands. These shrubs are truly armed and dangerous. I should remember to follow Russell's account of how the Pima collected the fruit, and beat the bush with a stick first! 1984 By the Prophet of the Earth: Ethnobotany of the Pima. Reprint of book published by San Vicente Foundation . University of Arizona Press. Tucson. 1979 Pollen and Plant Macrofossil Vegetation Record Recovered from Hinds Cave, Val Verde County, Texas. Masters Thesis. Texas A&M University. ) Pulblished by the Department of Anthropology. Everitt, J. H. and D. L. Drawe. 1992 Trees, Shrubs, and Cacti of South Texas. Texas Tech University Press. Lubbock. 2001	Food Plants of the Sonoran Desert. University of Arizona Press. Tucson. 1962	Revision of Condalia Including Microrhamnus (Rhamnaceae). Brittonia 14:332-368. 1908 The Pima Indians. In Twenty-sixth Annual Report of the Bureau of American Ethnology, No. 26. [1904-1905], pp. 17-389. Washington, D.C.
1999	A Field Guide to Common South Texas Shrubs. University of Texas Press. Austin. 2003	The Native Americans of the Texas Edwards Plateau. University of Texas Press. Austin, Texas. Ripening fruit of knifeleaf condalia. Crushed fruits, showing deep purple pulp.